Most (if not all) women love putting their best face forward. The face is typically what tends to draw people in. The various components of the face also play a major role as well. The wideness and brightness of a smile, clarity of the eyes and the shapes of the eyes and nostrils are other things people subconsciously pick up on. Out of all of these different facial characteristics, one of the parts that gain the most attention is the skin. When a woman walks into the room with glowing skin, she lights up the place. Glowing skin is significant because it usually is a great indicator of good health and regular maintenance. Drinking lots of water and eating the right fruits and vegetables will help a person maintain healthy skin. Outside of proper nutrition, adequate rest, stress-free living and exercise, there are some topical treatments that will help the skin thrive at its best. Depending on the skin type, exfoliation is a great treatment to employ on a regular basis at home. This facial treatment is excellent for sloughing off dead skin cells. When dead skin cells collect on the surface, this is a breeding ground from breakouts and unsightly patches. 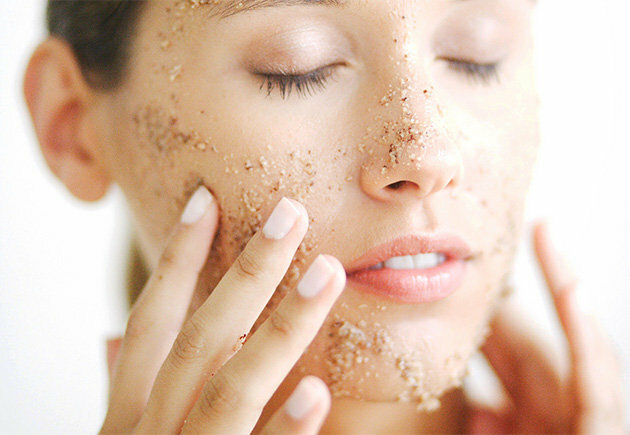 Exfoliation involves the use of a thick mixture (typically made of sugar, salt, oils, coffee grinds and/or oils) that’s applied to the skin and gently rubbed all over. After the process of exfoliation, the skin is incredibly smooth to the touch. This is also a great form of hyperpigmentation treatment. To decrease the appearance of hyperpigmentation, cell turnover needs to take place. The quicker the dead skin cells are scrubbed away, the faster the new skin cells will emerge. Even after washing and exfoliating the face on a regular basis, the skin still traps so much debris and dirt that initially goes unseen. As we sit in traffic, travel in airports, work in public places and interact with lots of people, it’s almost inevitable to attract deeply-embedded dirt in our skin. Because of pollution and allergen, the skin will get dirty just because of daily living. As a result, the face will collect oil and dirt. When it eventually gets to the surface, it shows up in the form of blackheads, whiteheads or clogged pores. Extractions involve an esthetician using a small tool to push the oil and dirt to the surface of the skin. This process also includes steaming. Steaming allows the pores to open up more. Extractions are much easier to do on pores that are already open. Purifying masks are great for treating the skin in a different way. A person who has oily skin will want to use a purifying mask made of clay. Clay is good because it helps to absorb the oil and impurities that easily collect on oily skin. It helps to cool down the skin and alleviate any areas where there are red splotches or unevenness. Alleviating the skin of the oil and build-up will simultaneously help any underlying issues with acne as well. Continual use of purifying masks will generally improve the appearance and texture of the skin. These are a few of the different facial treatments that are normally offered by a local esthetician. While they may be done at home, salon-grade tools and products allow the skin to get the most beneficial treatments. When it pertains to the face, it’s better to leave some things to the professionals.